What Day Of The Week Is October 4? 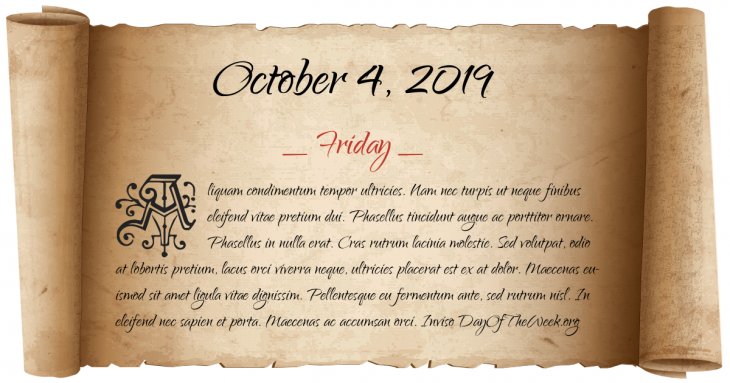 October 4, 2019 is the 277th day of the year 2019 in the Gregorian calendar. There are 88 days remaining until the end of the year. The day of the week is Friday. Formation of the Holy League of Ferdinand II of Aragon, the Papal States and the Republic of Venice against France. Foundation of Rosario in Argentina. The Fort Wilson Riot takes place. Creation of the state of Belgium after separation from The Netherlands. World War II: U.S. captures Solomon Islands. Leave It To Beaver premieres on CBS. Space Race: Launch of Sputnik I, the first artificial satellite to orbit the Earth. Basutoland becomes independent from the United Kingdom and is renamed Lesotho. Who were born on October 4?